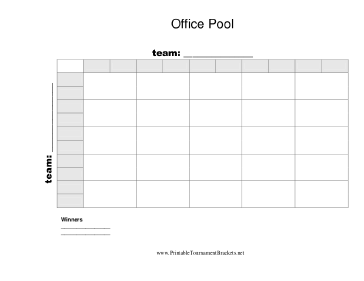 A 25-square grid to be used in office Super Bowl pools, basketball finals, or other legal wagering settings. This free printable tournament bracket list is easy to download (in PDF or DOC format), customize (DOC version only), and print. With Printable Tournament Brackets in PDF format, you can download and print tournament brackets (requires Adobe Reader or another application that can read PDF files). Fill them out by hand, and you're good to go. Customizable Printable Tournament Brackets are also available in DOC format (requires Microsoft Word, Google Docs, or other word processing tools that can read DOC files). You can download them, edit them on your computer to add, remove, or change items, and them print them out. If you don't see a tournament bracket design or category that you want, please take a moment to let us know what you are looking for.